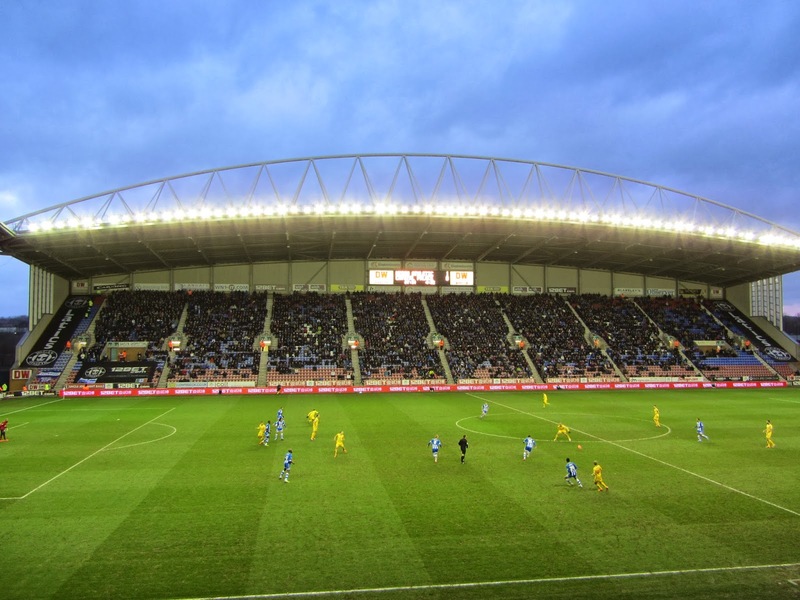 My second stadium of 2014 was on Saturday 25th January at the DW Stadium in Wigan, Greater Manchester. The match was Wigan Athletic vs. Crystal Palace in the F.A. Cup 4th Round. 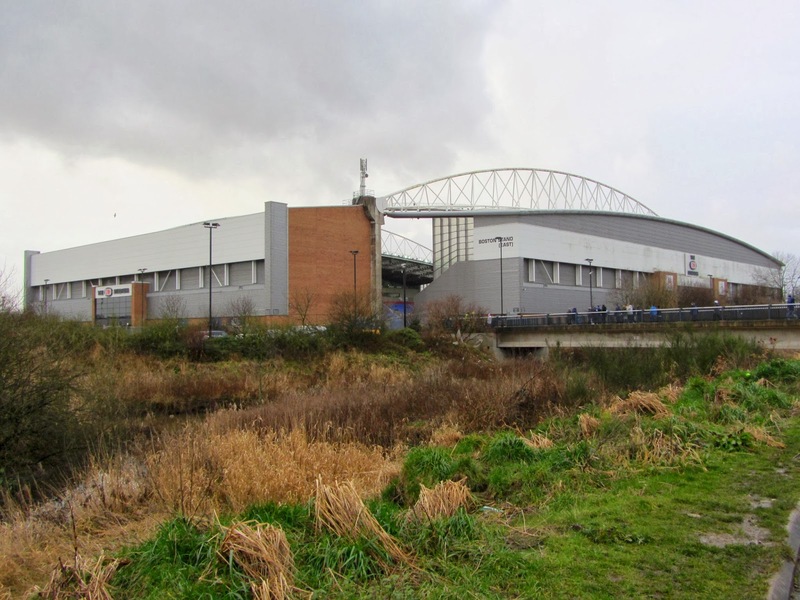 The DW Stadium is nestled in a retail park near the banks of the Leeds and Liverpool canal. Wigan North Western and Wigan Wallgate railway stations are around 1.5 miles south-east of the ground in Wigan town centre. The ground has been home to the club since 1999 when they moved there from their Springfield Park home which they had inhabited since 1932. 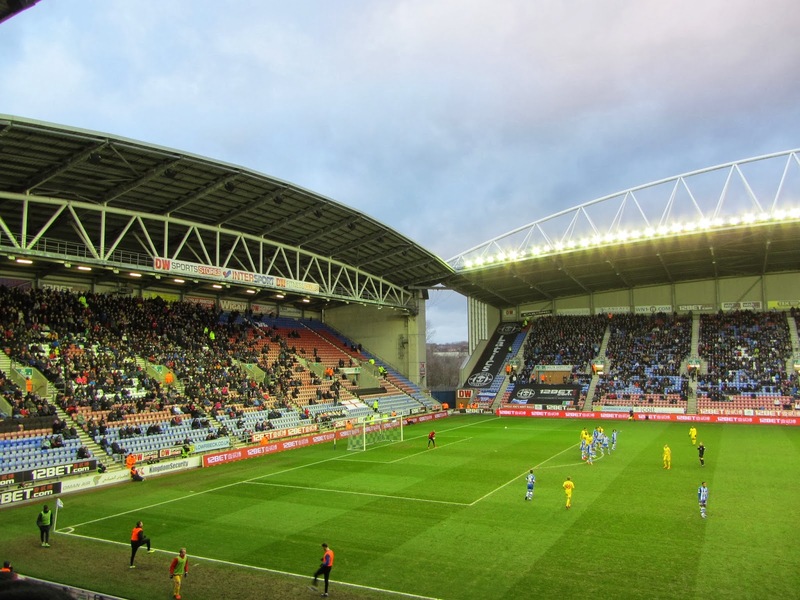 The DW Stadium is made up of four separate single-tier stands of similar heights with fairly narrow gaps between each of them. The largest stand is the Boston Stand on the eastern side of the ground which can hold 8,238 supporters. Opposite this is the Springfield Stand which has a lower capacity of 6,100 seats because the top section of the stand is given over to the hospitality areas. This Springfield Stand also features the club reception, shop and ticket offices and a restaurant. The North and South ends are near-identical with both able to house 5,400 fans. Away supporters are positioned in the North Stand though the South Stand was closed on my visit due to lack of demand. The interior differs somewhat between the stands with the South Stand being home to a DW Sports fitness lounge and the North Stand having a marquee located within. Crystal Palace started the game strongly and the Premier League side nearly took the lead in the 8th minute when some neat link-up play culminated in Cameron Jerome's goalbound effort being clawed away by Wigan goalie Ali Al-Habsi. Wigan pushed forward as the half progressed and in the 36th minute grabbed the opening goal of the game. James McLean was able to find space down the left wing and he advanced into the box before squaring it to Ben Watson to sidefoot into the net. The hosts continued to have the upper hand in the second half but spurned their chances to double their lead. In the 65th minute Crystal Palace manager Tony Pulis made a double substitution throwing on Aaron Wilbraham and Dwight Gayle in place of Cameron Jerome and Marouane Chamakh and this took only a few minutes to pay off as Wilbraham poked home a corner to level the tie. The final 20 minutes were end-to-end as both sides looked for a winner and in the 78th minute Wigan got their noses in front once more. On the counter attack Roger Espinoza passed out wide to James McLean who cut inside and from the edge of the area struck low past Palace goalkeeper Julian Speroni. The game could have gone either way in the final few minutes as the visitors pushed everyone forward but there were no more goals which meant the reigning F.A. Cup champions moved onto Round 5.